I’m taking a moment today to wish Todd Palin a happy birthday. Not only does he deserve to be honored for so obviously being a wonderful husband and father, but he deserves recognition for being a fine example of what every man should aspire to be. My last conversation with him left such an impression on me. I remember listening and thinking, “Every young man needs an opportunity to sit and talk to Todd.” As an educator in a public school, I see the needs of our youth, so as he spoke of the integrity and work ethic that are so needed in our young people, I wished they all could listen and learn from this man. Todd Palin is what we would call a man’s man. He’s not afraid to get his hands dirty building houses, working on the North Slope, or racing his snow machine, certainly. At the same time, he’s never been too macho to style Piper’s hair and change Trig’s diapers. 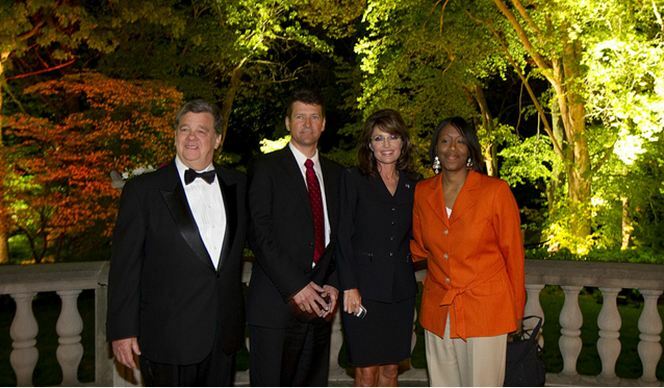 Furthermore, he’s secure enough to allow his wife to shine, but make no mistake: Governor Palin very much respects and honors him. He is, indeed, the complete package. Happy Birthday to Todd Palin! Today is former First Dude of Alaska Todd Palin’s birthday! We’ve admired the former First Dude as we have watched him stand strong beside Governor Palin and support her as she has fought to lead our country in a positive direction. He has served as a role model for husbands, fathers and young men everywhere. Todd has displayed an enviable level of commitment, strength, and gentleness in his home life, dedication in his business and professional endeavors, and competitiveness as a champion Iron Dog racer. On behalf of all the authors of the Sarah Palin Information Blog, I want to wish Todd a very happy and blessed birthday. May the Lord bless you with many more years to come, and may at least 8 of them be spent as First Dude at the White House! What I say now, I say as a proud former union member and the wife, daughter, and sister of union members. So, as a former card-carrying IBEW sister married to a proud former Laborers, IBEW, and later USW member, please hear me out. What I have to say is for the hard working, patriotic, selfless union brothers and sisters in Michigan and throughout our country: Please don’t be taken in by union bosses’ thuggery like Jim Hoffa represented yesterday. Union bosses like this do not have your best interests at heart. What they care about is their own power and re-electing their friend Barack Obama so he will take care of them to the detriment of everyone else. To the same degree Americans are concerned about irresponsible, greedy corporate execs who got cushy bonuses from taxpayer-funded bailouts, we should also be concerned about greedy union bosses who are willing to tank our economy just to protect their own power. As union history shows, power and greed corrupt. Just because you claim to represent union members doesn’t mean you are on the side of the angels. The greed of too many of these union bosses has all but destroyed the labor movement in this country, helped chase away our jobs, and is killing the American dream. To see where this leads, look at what’s happening to the working class in our industrialized cities. These cities are going to hell in a hand basket thanks to corruption, crony capitalism, and the union bosses’ greed. The union bosses derive their power from your union dues and their promise to deliver your votes to whichever politician they’re in bed with. They get their power from you, and yet their actions ultimately hurt you. They’re chasing American industry offshore by making outrageous, economically illogical demands that they know will never work. And now that they’ve chased jobs out of union states, they’re trying to chase them out of right-to-work states like South Carolina, so eventually the jobs will leave America altogether. But these union bosses will still figure out a way to keep their gig, and so will their politically aligned corporate friends. As long as these big corporations have a good crony capitalist in the White House, they can rely on DC to bail them out until the whole system goes bankrupt, which, I am afraid, is not very far off. When big government, big business, and big union bosses collude together, they get government to maximize their own interests against those of the rest of the country. So, now these union bosses are desperately trying to cast the grassroots Tea Party Movement as being “against the workingman.” How outrageously wrong this unapologetic Jim Hoffa is, for the people’s movement is the real movement for working class men and women. It’s rooted in real solidarity, and not special interests and corporate kickbacks. It represents the needed reform that will empower workers and job creators. We stand with the little guy against the corruption and influence peddling of those who collude to grease the wheels of government power. This collusion is at the heart of Obama’s economic vision for America. In practice it is socialism for the very rich and the very poor, but a brutal form of capitalism for the rest of us. It is socialism for the very poor who are reduced to a degrading perpetual dependence on a near-bankrupt centralized government to provide their every need, while at the same time robbing them of that which brings fulfillment and success – the life-affirming pride that comes from taking responsibility for your own destiny and building a better life through self-initiative and work ethic. And Obama’s vision is socialism via crony capitalism for the very rich who continue to get bailouts, debt-ridden “stimulus” funds, and special favors that allow them to waive off or help draft the burdensome regulations that act as a boot on the neck to small business owners who don’t have the same friends in high places. And where does this collusion leave working class Americans and the small business owners who create 70% of the jobs in this country? Out in the cold. It’s you and your children who are left paying for the cronyism of Obama and our permanent political class in DC. Ask yourself if the folks you heard demonize concerned, independent Americans yesterday really speak for the working class when they’re all too happy to burden your families with the bill to bail out the President’s friends on Wall Street. We should not forget that for all his lofty rhetoric, President Obama is a Chicago politician. Graft, cronyism, and quid pro quo are the well-known methods of an infamous Chicago political machine, of which Barack Obama emerged. This corruption isn’t just the result of a few bad apples. It’s the nature of a skewed system that’s typical of one not allowing a level playing field. If one desires opportunity for all, then the only solution is sudden and relentless reform. I know of what I speak. I too served in public office in a state that had a corruption problem. The difference is that I fought the corrupt political machine. Barack Obama used the machine in his state to advance. He never challenged it. And he’s evidently brought the same Chicago “pay-to-play” practices to the White House. It’s sad to see much of the labor movement fall lock step behind a President whom Hoffa calls upon to partner in “waging war” against patriotic Americans. I will never forget that as a governor, in trying to be a friend to the working men and women in our unions, I gave a speech on August 27, 2008, at the annual AFL-CIO meeting in Anchorage. There, union members humbled me with a standing ovation for fighting the corruption in Alaska and for bringing parties together for progress on energy development projects. Then just two days later I landed on the national stage as John McCain’s running mate, and the union leadership turned on me from that day forward even though I had not changed one iota in my plans, principles, vision, and commitment to jobs for working class Americans. The only difference was I was challenging the politician the union bosses were committed to electing. It was almost comical, this lesson learned with their new spots revealed so quickly. Recently someone commented: “I’m a union member. I’ve been a Democrat all my life. Now I’ll vote for anyone with a plan to save America.” I know what that person is feeling. I want all good union brothers and sisters to know that there is an alternative. The grassroots, independent Tea Party Movement articulates a real alternative rooted in free men and free markets, not the cronyism of Barack Obama and the permanent political class in DC. Their cronyism is why we have no job growth, massive unsustainable debt, and a housing market in the tank. Too many politicians are simply addressing the economic symptoms instead of fighting the underlying disease. The path forward is through reform. On Saturday, I outlined some ideas about that reform, and I will continue to do so. In the meantime, good union brothers and sisters, don’t let Hoffa tell you what to do. He doesn’t represent the real interests of working men and women. He’s not doing you any favors. He’s just living off your paychecks. By any standard, and even allowing for multiple voting by enthusiasts-if that is the case NRO’s 50,000+ poll result is astounding. For one candidate to get 74% of the votes shows, at the very least, a huge degree of enthusiasm for that person. This of course gives the lie to the latest media theme that “Palin’s support is declining”, which was further shown to be ridiculous by the turnout for her in Iowa and New Hampshire last weekend which eclipsed the turn out for any other candidate. The indomitable Stacy McCain of “The Other McCain” blog fame has a first rate article up on Sarah Palin’s visit to New Hampshire. He is best, I think, when he castigates and chastises his fellow journalists and this column (whose title “no sympathy for the media devil” sets the tone nicely) is no exception. 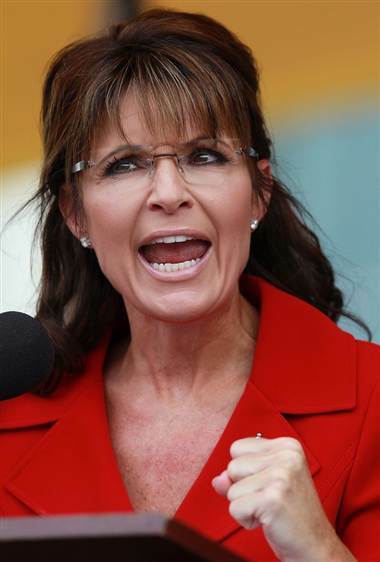 Plus a fair and balanced overview of Palin’s visit, especially vis a vis Romney’s concurrent visit. McCain appears to not have a dog in the hunt at this point so his column is especially clear sighted and prescient. I appreciate readers could have gone directly to his site but even with his 6,000,000 hits there are still some who are not aware of it, so my site which sends viewers to there, can assist with getting the messages in his important report, to as many as possible.